By Joe Posnanski, NBC National Columnist. Original article here. Hi guys, sorry for the bulk email. I just wanted to see if you had a chance to watch any of that Rafael Nadal-Juan Martin del Potro tennis match from here at the Olympics. It was pretty thrilling stuff. Those two guys blasted thunderclaps at each other for three crazy sets. Then the third set went into a tiebreaker. Each point was like a novella. The crowd was delirious, practically incoherent with joy. It was incredible. Anyway I know tennis is not your sport but I was wondering if you happened to see Nadal in that tiebreaker. You know, Nadal is a pretty accomplished guy. Fourteen grand slam titles. Nine French Opens in ten years. Four-time Davis Cup champ. And there he was in that tiebreaker, grinding with all his heart, playing with every ounce of emotion in his body, caring so deeply. Why? Because this is the Olympics. I guess the point is, all due respect, you guys blew it. Sure, I understand why you decided not to come to Rio to play golf. I get it. Golf is a weird fit for the Olympics. The Olympic Games really should be the Mount Olympus for sports, meaning it should be each sport’s most important event like it is for for track and swimming and gymnastics and dozens of other sports. It can never be Olympus for men’s golf. No, men’s golf has the Masters and the U.S. Open and the Ryder Cup and the President’s Cup and the Open Championship and the PGA Championship and the World Golf Championships and the Players’ Championship — so many championships. And yes, it’s true, golf wasn’t in the Olympics when you were kids, so you never dreamed about being here, never planned a spot in your life for the Olympic Games. And, yes, there were concerns about Brazil — are concerns about Brazil — about Zika and crime and security and political upheaval and logistical breakdowns. I get it. But you blew it, guys. The biggest (bleeping) show on earth, guys, and you had a chance to be a part of it. You had a chance to show new parts of the world just how wonderful your sport is. You had a chance to support women’s golf, to support amateur golf, to blow the mind of some kids who might never have seen this crazy game before. Yes, you had a chance to give the sport you love, the sport that has given you dream lives, a boost, a big stage. I don’t like the phrase “grow the sport.” But everybody knows that golf is in a bit of a lull. Nike just pulled out of the equipment business. Participation stagnates. The Tiger hangover isn’t going away anytime soon. Nobody expects that the Olympics turns everything around. But it’s something new and fresh. It’s an opportunity. Thing is, I suspect you did realize it. You just decided to pass anyway. You’ve talked about it. Rory, you talked bluntly and with admirable honesty about your disinterest in growing the game. ‘I don’t feel like I’ve let the game down at all,’ you said. ‘I didn’t get into golf to try and grow the game. I got into golf to win championships and win major championships.’ I respect you being that honest. And I think it’s an astonishingly bad attitude about a sport which earns you tens of millions of dollars. But forget what being here might have done for golf. I’m more interested in the second way you blew it — guys, you blew it for yourselves. This was, literally, a once-in-a-lifetime chance for you. Yes, there will be other Olympics and at least one of them will have golf in it. But it will never again be the FIRST Olympics with golf. It will never be like it is here on Sunday, with a beautiful blue Brazilian sky and a miraculous little golf course carved out of nothing and a sellout crowd coming out to see a sport many of them have never seen before. You will never play in a tournament that has the spirit of this one, where all the odds were stacked against it and yet it came together and people had the time of their lives. You will never again see it like it was at the 18th when fans gave Brazilian golfer Adilson da Silva such an ovation that he broke down in tears. Or how about that moment when Rickie Fowler and Bubba Watson got to go hang out at the practice pool with the U.S. swimmers. As they left, the swimmers rang the bell. This is what they do whenever one of them heads out for a race. Fowler and Watson did not know what was happening, so they turned around. And they saw and heard the U.S. swim team, the greatest swim team in the world, chanting ‘USA! USA!’ for them. ‘Words can’t really put it into perspective,’ Fowler would say. You think that happens at the Buick Championship? Or how about a group of Brazilian fans following around Matt Kuchar just so they can shout “Koooch!” as he charged on Sunday. Or how about coming down the stretch on a Sunday at the Olympics with what turned out to be a fantastic leaderboard — Justin Rose and Henrik Stenson and Matt Kuchar shooting it out for themselves, for their countries, for a little piece of history. This isn’t just a golf tournament. This is different. You play golf, sure, but then you go watch some of the best athletes in the world — and they’re all incredible. The athleticism you see at team volleyball or rowing, it’s overwhelming. You walk around with synchronized swimmers and team handball players and shooters and archers and judokas and gymnasts, and they all speak different languages, and they all look so different. And you’re connected to them. You’re all Olympians. You missed it. Hey that’s not to say that it’s perfect here — it isn’t. Rio is a sprawling and complicated place and while there is so much spirit here, there is anger too, there is poverty, there are inconveniences, issues, mosquitoes, risks. Just like everywhere. You guys don’t live in a bubble. This is a big and tangled world. You don’t let these things keep you from living. In the end, I don’t know if golf belongs in the Olympics. But that’s not the point — golf IS in the Olympics, and you guys had a chance to be here at the start, to be part of this bold experiment for the game you grew up playing. And you decided to stay away. You had a chance, Rory, to win Ireland’s first gold medal at these games and only the second gold medal in the last 20 years. You had a chance, Jason and Adam, to be part of the Australian Olympic team, which is like one giant party train moving through Rio. 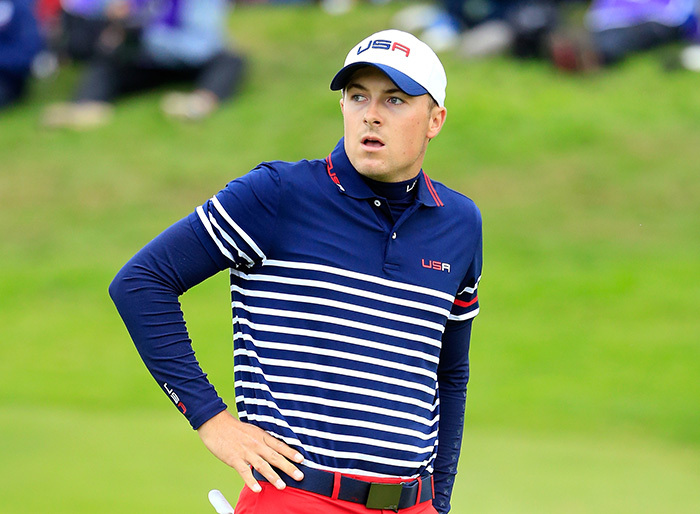 You had a chance, Jordan, to be part of the happiest week in golf. And that’s what it is here: Happy. It isn’t like any other golf event on earth. Nobody is saying it is as important as a major championship or the Ryder Cup or any other big money tournament. It isn’t as important. No, he pushed to the same level of extreme, and he got lost in the moment, and he was utterly heartbroken when he lost, because these are the Olympics. True, it’s not a 100-meter race against Usain Bolt. It’s not the 200-meter butterfly against Michael Phelps. It’s not a balance beam duel with Simone Biles. But it is the Olympics. The biggest (bleeping) show on earth. And I’m sorry you missed it.